Welcoming His Holiness were the parish priests, V. Rev. Stavrophor Milutin Veljko, together with Episcopal Deputy V. Rev. Stavrophor Vasilije Tomic, V. Rev. Stavrophor Lazar Vukojev, V. Rev. Stavrophor Prvoslav Puric, V. Rev. Stavrophor Stavrophor Ljubomir Rajic, V. Rev. Zlatibor Djurasevic, Protonamesnik Aleksandar Crnogorac, secretary of the Diocesan Council, and Fr. Jovan Marjanac. 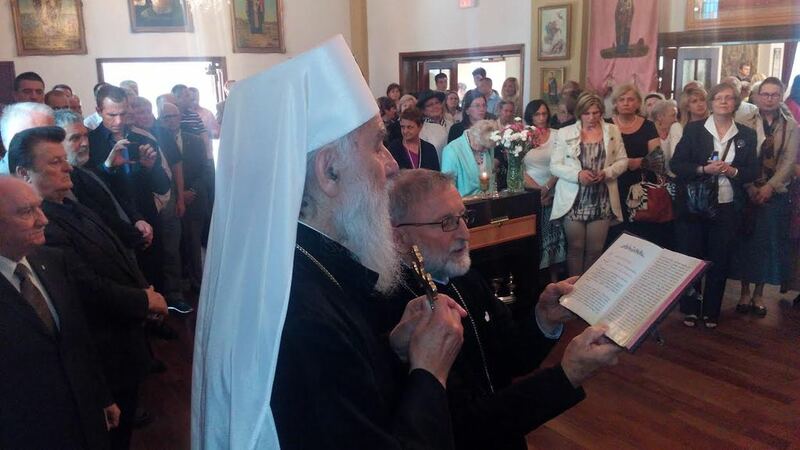 Together with the clergy many parishioners of this oldest Serbian church in Toronto welcomed the Serbian Patriarch. Following the Doxology, served by Fr. Prvoslav Puric, Fr. Zlatibor Djurasevic, Fr. 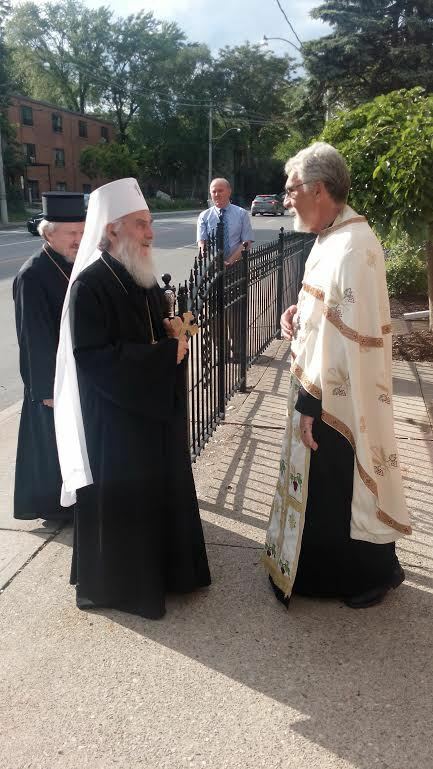 Jovan Marjanac and Protodeacon Damjan Bozic, the patriarch was greeted by the parish priest. He thanked His Holiness for his visit and His Grace Bishop Mitrophan of Eastern America, in his own name and on behalf of the clergy of this parish, Protonamesnik Milos Puric, as well as all the faithful. 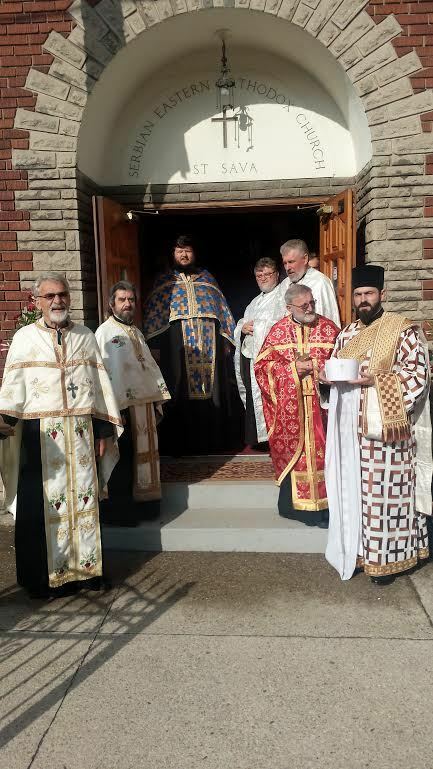 "Our church, dedicated to St. Sava, has the great honor," said Fr. Milutin, "for today in our church is the first hierarch who sits on the throne of St. Sava. 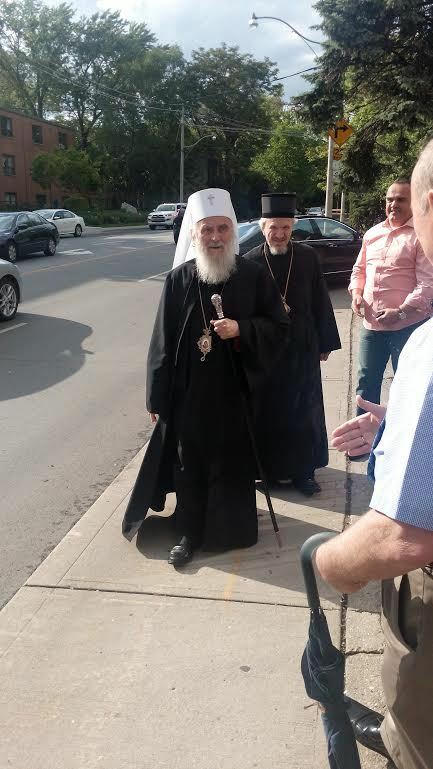 Serving once in our church was Bishop Nikolaj Velimirovich. That time, and this day, have entered the radiant history of our church where we pray to God and serve Him. Our church is small, but its history is rich and great. Many have been baptized and married here. Here, many have been sent their way to eternal rest. This church preserved our people here, in this diaspora, and will always keep them. We will be true to our mission as guardians of holy Orthodoxy, and always loyal and obedient to the mother Church, and particularly to You, Your Holiness. "Patriarch Irinje addressed the faithful, saying: "Maybe our church is small, but the Holy Spirit within it, is immeasurable. He is with you and is given to everyone through their participation in the Holy Mysteries. The Church has not forgotten you even though you are far from your homeland. You are far from the Patriarchate of Pec, your Decani and Zica, but you are not far from their prayers and love. Perhaps, geographically, you are far but not so in spirit. You are the people of God and the heart of the Church." The patriarch told the faithful to preserve their traditions. Especially their Krsna Slava and their language. Our home is a mall church - the family Church. Every true Serbian home has its protector, just as each Orthodox church does. His Holiness shared his enthusiasm, for he was in a church where all the faithful sing during the service. Then His Holiness said exaltedly and with confidence: "God will preserve our people even though we have many temptation, as long as in our churches we sing together Lord have mercy! We have many martyrs and ditches with the relics of martyrs, but they are victors. And we who celebrate them, through them we become victors. I thank you for your welcome and may God bless you! Remain people who love their faith, who love freedom and all of God's creation." The St. Sava Church, together with the chuch hall, was consecrated May 22, 1955. This is the oldest Serbian Church in Toronto. The church was consecrated by Bishop Dionisije, and the first service was served by St. Nikolaj Velimirovich. In the Spring of 2008 the church was renovated: the altar area and floors. The same year the church hall was renovated. The diocesan choir "Kyr Stefan the Serb" is attached to this parish. The choir was founded with the blessing of Bishop Georgije, upon the initiative of Prota Vasilje Tomic. Jasmina Vucrevic is the choir director. The "Holy Myrrbearers" Kolo Sestara regularly assists in organizing meals and humanitarian events. In 1997 the folklore group "Stazilovo" was started, which has over 120 children of all ages.